Today, we are going to take a look at the highly anticipated The Elder Scrolls Online. The game, which is slated to be released in April of 2014, has been spiking quite a bit of controversy online in recent weeks. It is being compared to other MMO's, and while The Elder Scrolls Online is an MMO, is it really fair to compare it to other games in its genre? 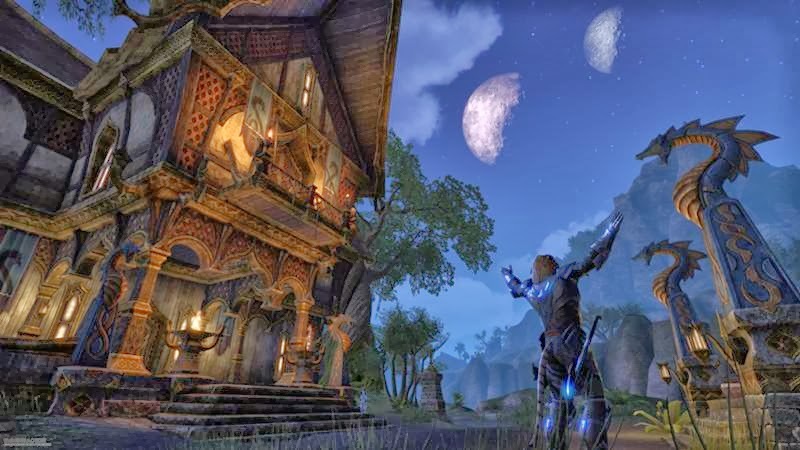 The Elder Scrolls Online's lore, setting, and background are all very closely based on the single-player franchise that dates back to 1994 with The Elder Scrolls Area. Zenimax Online Studios, part of Bethesda Softworks, has a giant task on their hands to create a game that will please the loyal single-player fan base, with myself being one of those people. So without further delay, lets explore what this game is actually about, how its game play mechanics feel, how the games economy works, character classes and customization, and combat. Plot - The game takes place in the 2nd era 583, during a period known as the Interregnum. It is during this time that the Akaviri Potentates and all of his heirs were murdered by the Dark Brotherhood, that left the Ruby Throne without an heir, and thus everyone was contesting for the throne in Cyrodiil. The Aldmeri Dominion - The Aldmeri Dominion was founded by Queen Ayreen the ruler of the Summerset Isle. She made alliances with fellow mer the wood elves of Valenwood, and the beastfolk Khajiit of Elswyer to form the Aldmeri Dominion. Queen Ayreen fromed this allaince to help save the world, and to ensure that a wise and long living elf, who lives much longer then humans, can ascend to throne to ensure stability and safety of a new empire under elven rule. The Daggerfall Covenent- The Daggerfall Covenant is the last of the three factions, and probably also the most stable. It consists of the Bretons of High Rock, the Redguards of Hammerfell, and the Orcs of Orsinium. This alliance is based clearly on mutual trade benefits, and freedom. The Daggerfall Covenent wishes the Empire to return to the days of its pasts freedoms, and is vehemently opposed to the Aldmeri Dominion, and its views of eleven supremacy as the only just way to rule. As you can see, these 3 classes will make the game...interesting to say the least. As these 3 factions will fight and view for control of Cyrodiil and the Ruby Throne. 1. Character Class and Customization- The Elder Scrolls Online offers pretty much the same character customization that has been in the past Elder Scrolls single-player games. You can customize your character's appearance to your hearts content. Everything is available from hairstyles, facial hair, tattoo's, eye color, eye shape, brow type, height, weight, the whole 9 yards. Zenimax did very well here allowing everyone to create a unique looking character to play in the world. Dragon Knight - is a melee based classes who uses Ancient Akaviri martial art style of fighting. Templar - A class that is based on using powers of divine light to heal allies and damage enemies. Sorcerer - A mage/magic based class that focuses on spell casting and staves. Nightblade - This classes focus on sneaking and stealth to get the drop on his enemies. Its important to note that ALL CLASSES can use any weapon and wear any armor of the players choice. This means you can have for example a Paladin Templar who wears heavy armor, uses sword and shield, and focuses on healing spells. Perhaps you would like to play a Witchhunter who uses a bow and magic spells to destroy his enemies? No problem, you can choose the Sorcerer class and wield a bow with light armor. The options are there for you to be as creative as you want with your character, ultimately its up to you how you want to play. Each weapon style has its own set of skills that are unlocked with skill points. As you level up and gain skill points, you can unlock class, racial, weapon, and armor abilities as well as the crafting tiers. Overall, I think Zenimax done extremely well with this part of the game. 2. Combat - In my experiences with combat, its not too bad. However it does have room for improvement. The most recent beta is supposed to have better collision detection, so this means enemies can no longer run right through you. So this will be a big improvement to the game. Weapon use can feel a little clunky at times, I have no doubts through that the new collision detection being added will remedy most of those issues. Overall, combat is a work in progress, but it keeps getting better, So I have very high hopes it will be polished off before launch. 3. Immersion and Quests - Now this is where IMO Zenimax has done an outstanding job. First, the quests in this game are great from what I have gotten to play in the beta's so far. They are interesting, fun, and not repetitive. While the quest rewards could perhaps use a little tweaking, this is just being picky. Overall they have done a great job with the questing. 4. Game Economy and Crafting System- The game includes a very detailed in game economy and crafting system. It has a plethora of options for every class. It ranges from alchemy to wood working and everything in-between. You craft items by gathering the appropriate raw materials from the world, and then going to the right crafting station to make them. Heavy Armor is made my using the Anvil and Forge, Light Armor under the Clothing Table, Bows, Staffs, and Shields are made under the woodworking table, and potions are made under the achlemy table. There are crafting stations for every skill, and enchanting as well as most of your other series favorites are there as well. All crafted equipment has a level requirement, so as you level up, it will take more raw materials to create higher level gear which will look different and provide more protection. Crafting higher level potions makes them more powerful such as heals more hit points, or restores more mana then lower level ones. In terms of shops, I found it rare to buy very much equipment. The prices are restrictively high, and you can find equal or better stuff in the world itself, or crafting your own from the specific crafting tree your invested in. The only real downside I have found to the game economy and crafting system is the resource competition. You will have to really run around and explore to find the materials you need to craft. Other players will also be seeking out these same materials, and they are not instanced per se. They do come back pretty quickly, but don't be surprised if someone beats you to a node a few times and your forced to find another. While the crafting and economy system does have some flaws, specifically resource contention, overall I found this system to be pretty robust and I really liked it. 5. Player-Vs-Player(PVP) - The player-vs-player game play in this game may be the best part of it. Players can only fight against each other in Cyrodiil, and as far as I have seen, players from other factions can't visit the lands of opposing factions. However, don't let this discourage you. Cyrodiil is a pretty big place, and the huge and fun battles over keeps is just epic. Its wild to watch 40+ people storm a keep and watch the 40+ players inside type to defend it, and if the walls come down out comes the fighting. You must get allaince points, which are then used to help your faction. You must buy and put together siege equipment so you can smash down the walls of a keep, or kill the enemies coming out of it to help your team. Overall, the PVPO experience in TESO is epic, and once the collision detection is fixed before launch, it will get even better! Final Verdict - Overall, I think The Elder Scrolls Online has gotten a bad rap unfairly. The game is not World of Warcraft, and that's actually a good thing in this players opinion. The game's atomosphere feels very Elder Scrolls like, the art work and landscapes look beautiful in my opinion, and Zenimax has done a great job there in capturing the feel of the Elder Scrolls. I know some have been put off by the monthly subscription fee, but this is the one game I think it will be worth it. I would say there is roughly 1/2 of Tamriel that won't be unlocked until future expansions. This means there will be tons of content to come in the future. I think as long as Zenimax is able to keep pumping out new content in a timely manner, that the subscription is justified. The age old saying goes "you get what you pay for". If you want top notch support, your going to have to pay for it. I have no problem paying for a game that is quality and that I enjoy. The last thing I want for this game is for it to end up as some F2P(Free-To-Play) rubbish based on micro-transactions which really ends up becoming P2W(Pay-To-Win). I like the game, its worth a subscription to me, and I hope it doesn't go free to play. I was vehemently against this game considering I have played and own ever Elder Scrolls Game Since Arena. I think this game has a fine place in the Elder Scrolls. I don't know how long I will subscribe, but my time with this game will be money well spent. I hope this helps someone who may be on the fence with this game, I suggest you to try the game first before making any final judgements. you may end up liking it more then you expect to. The image used in this post was taken from The Elder Scrolls series of video games or from websites created and owned by ZeniMax Online Studios, the copyright of which is held by ZeniMax Online Studios. All trademarks and registered trademarks present in the image are proprietary to ZeniMax Online Studios, the inclusion of which implies no affiliation with The Elder Scrolls Wiki. The use of such images is believed to fall under the fair dealing clause of copyright law.The original image can be found on the Elder Scrolls Wiki.